Two testbed airplanes recently started flying the Dynon SkyView system! Both of these installations are of the 10" screen too! This is a big milestone for us - we consider it the start of what we call "Alpha" testing, where we shake out the really major performance and functional bugs while we drive towards feature-completeness. Then, at a later date, we'll roll out to a slightly wider audience of handpicked friend-of-the-company with our Beta program. We're doing a little experimenting with the latest social media tools. Come follow us on twitter at http://twitter.com/Dynon and become a fan of ours on Facebook! We now have a name for the (formerly known as) Next Generation family of Dynon products. 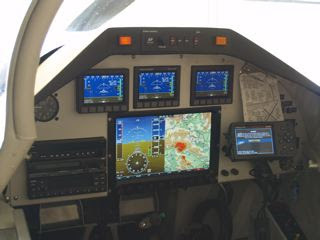 At Airventure 2009 we'll be unveiling the Dynon SkyView! It only took what seemed like endless sessions of forced pair voting (around the office), customer and pilot polls, and many "spirited" discussions. An interesting statistic is that once we came together on "SkyView", 11 out of 12 pilots preferred it to other leading names in blind comparison taste tests. So if you'll be in Wisconsin next week, come see the current status of the new SkyView products for yourself! We hope to see you at Oshkosh, in Building D, Booths 4053 & 4054. We have actual working hardware to give you an idea of what's coming...soon! Pricing is still TBD - we'll probably hold that close to the vest until we're closer to release.